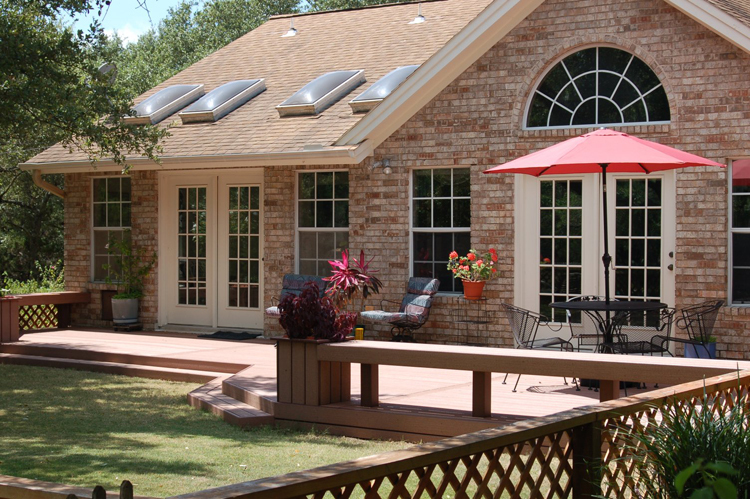 Here at Archadeck of Austin we receive calls from homeowners wondering if they can re-deck their existing deck. There are many reasons why homeowners want to re-deck. Sometimes it is because their existing decking is splitting, warping, discolored and showing signs of damage, but in some cases it is just because they want to change the look of their outdoor space and let the deck serve a new purpose. In some cases even if your decking boards are in bad shape your foundation itself can still be in good shape. Whatever the reason for wanting to re-deck may be Archadeck of Austin has limitless choices and designs to suit any taste with superb materials to boot. 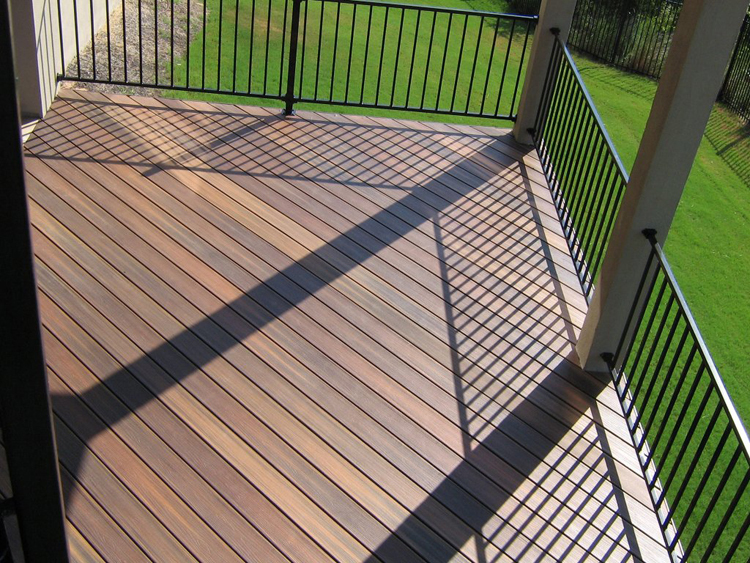 When it comes to thinking about re-decking, one word comes to mind – composites. Today’s composites have come a long way. The early plastic looking composites are a thing of the past. Composites are extremely low maintenance and worry free. They will not rot or warp. Composites also have unsurpassed mildew and mold resistance as well as resistance to insects and fungi. Composites won’t ever need to be stained or stripped and are easy to wash, just a little soap and water and they are good as new. Composites also carry some of the longest warranties on their decking boards within the industry. There is something else that seems almost too good to be true when it comes to today’s composites as well and that is their beauty. Technology has taken the look of composites to a whole new level with rich wood tones and graining that looks so realistic it leaves you questioning if it is real wood. Can you tell which one of these is the Fiberon Horizon Ipe composite and which one is real Tigerwood? 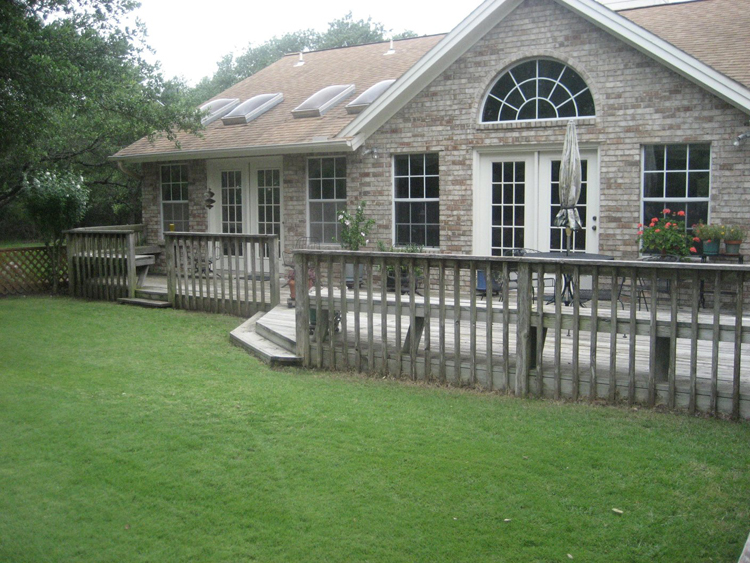 We recently completed a re-decking for a wonderful retired couple in Leander, TX. who had an existing wood deck that was a little worse for wear. The deck was grayed out, faded, decayed, rotting and was behind on maintenance. They decided to take a look into re-decking with composite so they would not have to worry about maintenance. We met with the couple and did an inspection of the deck. The frame of the deck was completely structurally sound and suitable for re-decking. We re-decked the structure with TimberTech Twin Finish in the redwood color and used a combed surface composite that carried a bit of red tine through it, to simulate the look of real wood. We also built planters and benches to open up the view of the yard so the couple would not feel as if they were boxed in. 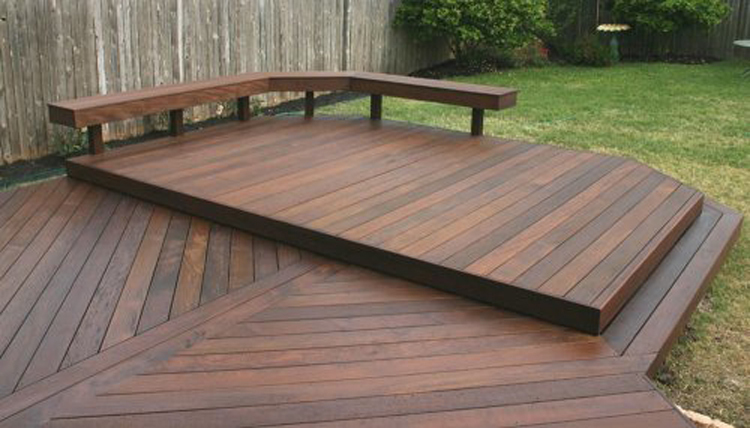 The final results of this composite re-deck are breathtaking. The homeowners said ” it made the whole house feel cleaner and lighter”. Not only do they get the beauty of a composite deck to enjoy every day, they no longer have to worry about laborious maintenance. They now have more time to enjoy their backyard, and their retirement. This entry was posted on June 27, 2011 by austinporchandpatio. It was filed under Austin decks, Decks, Fiberon Horizon, Materials, Re-decking, Tigerwood decks, TimberTech Twin Finish and was tagged with Archadeck of Austin, Austin deck builder, Austin decks, Austin tiger wood decks, Austin TimberTech decks, Composite decking Leander TX, decks Austin, Fiberon Horizon composite deck Austin TX, Re-decking Leaner TX, Tigerwood deck Austin TX, tigerwood decks austin, TimberTech Twin Finish deck Austin TX.